If the IceLink HVDC subsea interconnector between Iceland and UK, will be developed, more than 2,000 new megawatts (MW) of power capacity is expected to be developed in Iceland in the coming two decades. All these capacity additions will all be in renewable power technology. Most of it will be in the traditional types of Icelandic electricity generation, which is hydro- and geothermal power. However, substantial amount of the new capacity will be in wind power, making wind power the fastest growing type of generation in Iceland. It is hard to predict with precision how much capacity will be added to each of the three types of renewable generation mentioned above. 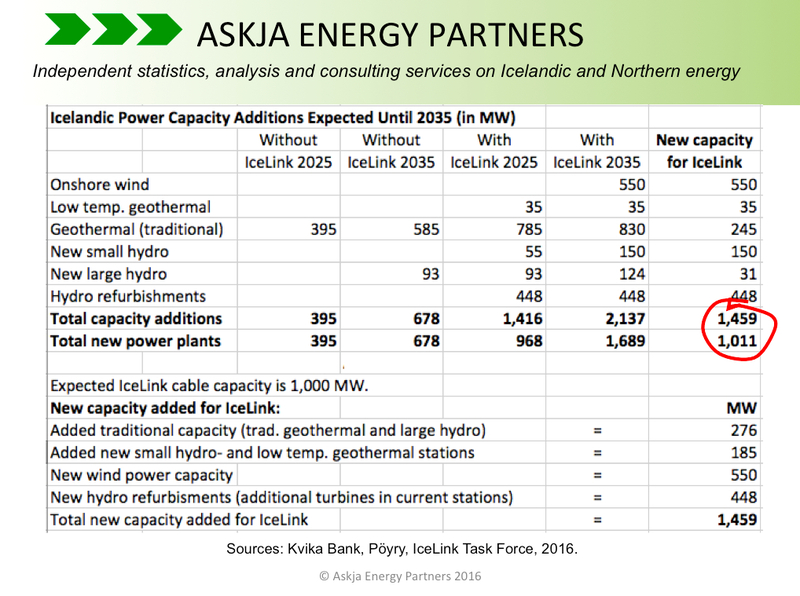 The table below shows two predictions, one by Kvika/Pöyry and the other by Askja Energy Partners. 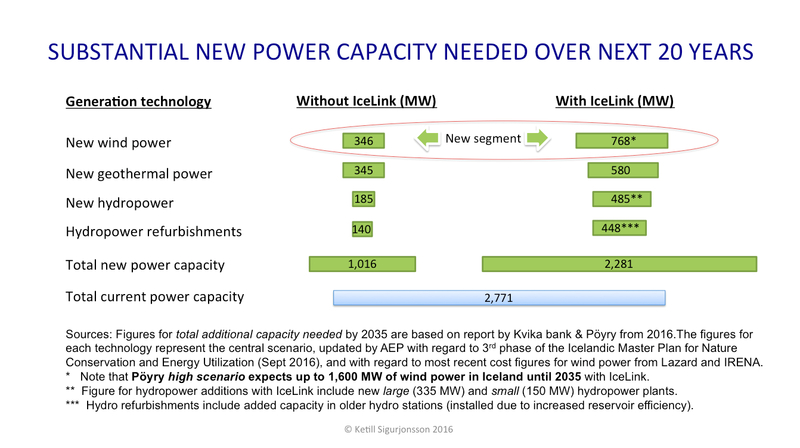 According to Kvika/Pöyry, IceLink will need approximately 1,459 MW of new capacity, bringing total new capacity in Iceland to 2,137 MW by 2035. Analysis of Askja Energy shows that Kvika/Pöyry may be over-estimating how fast new geothermal power can be developed in Iceland (and under-estimating the potentials of Icelandic wind power). We at Askja Energy, predict slower growth in new Icelandic geothermal power, and somewhat faster growth in wind power. In addition, it is very likely that new Icelandic hydropower can be developed somewhat faster than Kvika and Pöyry are forecasting in their central scenario. Note that the Askja Energy scenario assumes faster capacity additions in hydropower and wind power than Kvika/Pöyry, but substantially slower geothermal capacity additions. The result is less generation pr. 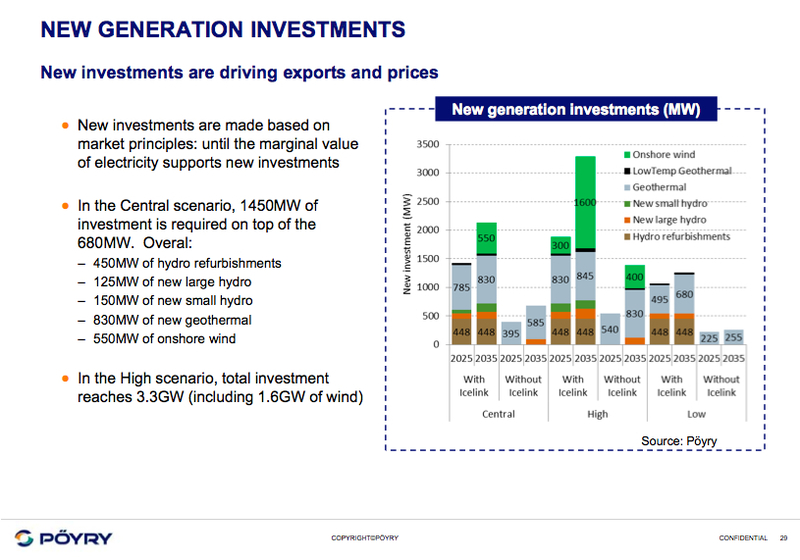 each new MW (thus, higher new capacity needed in total to deliver same/similar generation). All numbers are an estimation and may vary, such as due to what power projects exactly (in each category) will be developed. No matter if the forecast by Askja Energy or the forecast by Kvika/Pöyry will be closer to the real development, wind power can be expected to become Iceland’s fastest growing energy segment. If IceLink will be constructed, no type of generation in Iceland will grow as fast (in percentages) as wind power. As explained on the graph below. The question that remains, is if and when the decision will be taken on IceLink. But even without IceLink, it is likely that new wind power will be developed in Iceland in the coming years, as numerous locations in Iceland offer very high capacity factor for wind turbines. In their recent report titled “Subsea electric cable between Iceland and Britain – cost-benefit analysis”, Kvika bank and Pöyry seem to overestimate how fast Icelandic geothermal power can be developed. 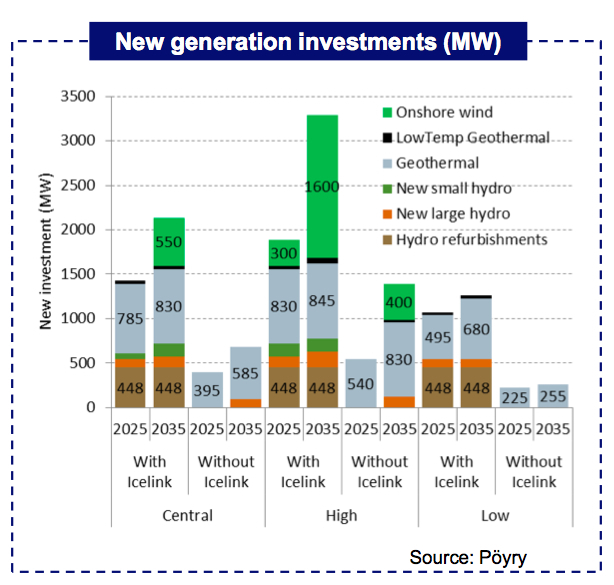 In their central-scenario, having regard to new demand from the IceLink subsea power cable, Kvika and Pöyry predict that by 2025 Iceland may have developed 820 MW of new geothermal capacity. This is somewhat surprising estimation, as it seems unrealistic to expect such a fast construction of new geothermal plants in Iceland. According to Kvika and Pöyry, Iceland will need around 1,416 MW of new power capacity by 2025 if IceLink will be constructed. As shown on the graphs at left and below, Kvika/Pöyry expect most of this new capacity to be in new geothermal power plants, with a capacity of 820 MW. According to their report, 785 MW will be new traditional geothermal power plants and 35 MW will be smaller low temperature geothermal stations (totally 820 MW in new geothermal power). The rest of the needed capacity by 2025, around 596 MW, is expected to include 448 MW in hydropower refurbishment (such as added capacity in current hydro stations), 93 MW in new large hydropower plants, and 55 MW in new small hydropower plants. Note that the exact predicted megawatts for each category are not absolute figures, so for each category there may be a few more or less MW. Thus, it is maybe not very surprising that the given figures in Pöyry’s slide-presentation for hydropower refurbishment, do not quite match (450/448), as can be seen on the graphs and also here on Twitter. Iceland offers very good geology for geothermal power development. However, it is costly and complicated to sufficiently establish and harness the geothermal resource in each new area. Having regard to the Icelandic experience in geothermal development so far, 785 MW of new large geothermal power stations may call for approximately eight to ten new development areas, each area with close to 100 MW of power capacity constructed in preferably two steps (starting with 50 MW or so). There may be some possibilities to construct new Icelandic geothermal stations with 100 MW capacity before 2025. However, such an intensive construction/utilization in a new area could substantially increase the risk of over-exploitation of the geothermal area. And it is also important to have in mind that due to environmental regulations, such as regarding planning and impact assessment, it becomes even more unlikely that up to ten new geothermal projects can be developed in Iceland in less than a decade. This does not mean that Iceland would not be able to deliver the power needed for IceLink in time. Due to well-known hydropower opportunities and good wind potentials, economical wind- and hydropower (in addition to substantial new geothermal power) would most likely ensure sufficient power supply for IceLink. But the scenario for each power category (geothermal, hydro, and wind) will most likely be somewhat different from what Kvika/Pöyry estimate. For some reason, Kvika/Pöyry made little effort to cost-analyze the development of wind power in Iceland. Having regard to numerous good sites for high-capacity wind farms in Iceland, it can be argued that wind power can fill in the gap which may occur due to slower than expected development of geothermal power. In our next article, we will be looking further into this issue, explaining how much wind power may be developed in Iceland in the coming decade. Following a tender in 2015, the Icelandic Ministry for Industries and Innovation signed Kvika bank and Pöyry to deliver advanced macroeconomic cost-benefit analysis of the impact of a subsea power cable between Iceland and Great Britain on Icelandic society. The report was published around mid-year 2016. 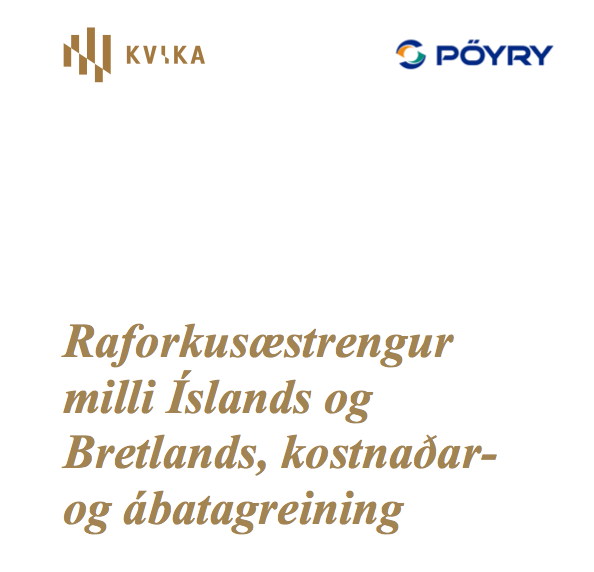 The Icelandic title of the report is “Raforkusæstrengur milli Íslands og Bretlands, kostnaðar- og ábatagreining“, which in English would read as “Subsea electric cable between Iceland and Britain – cost-benefit analysis”. The key assumptions of the report are based on the following issues: Development of electricity demand in Iceland, the possibilities of new electricity generation in Iceland (including wind power), the cost of the project (including cost of the subsea interconnector, converter stations, new power capacity, and new transmission lines), cable-capacity and cable-uptime, cost of capital, development of electricity prices in the UK, and possible support from the British government. These issues include a.o. analysis on how much new hydro-, geothermal- and wind power capacity is expected to be constructed in Iceland until 2035. The report by Kvika/Pöyry is highly interesting and includes extensive information which is very relevant to the project. However, it is obvious that its authors have made little effort in analyzing the possibilities of Icelandic wind power. This becomes evident when reading the part of the report that focuses on wind power (chapter 15.3.3). It is also noteworthy that the report makes absolutely no reference to the numerous recent university theses on Icelandic wind energy. And very limited direct references are made to the scientific paper “The wind energy potential of Iceland” by Nawri et.al., which so far is probably the main scientific examination on Icelandic wind potential. The result is that the report by Kvika/Pöyry only offers a somewhat general introduction of wind energy utilization, without any real analysis on the potentials of harnessing wind for electricity generation in Iceland. The authors of the report simply make the general claim that wind power is still more costly than most planned hydro- and geothermal power projects in the utilization category of the Icelandic Master Plan for Nature Protection and Energy Utilization. This claim is not very well supported in the report. But the result is a conclusion by Kvika/Pöyry, that it is unlikely that any wind power will be harnessed in Iceland unless the IceLink HVDC subsea interconnector will be constructed. 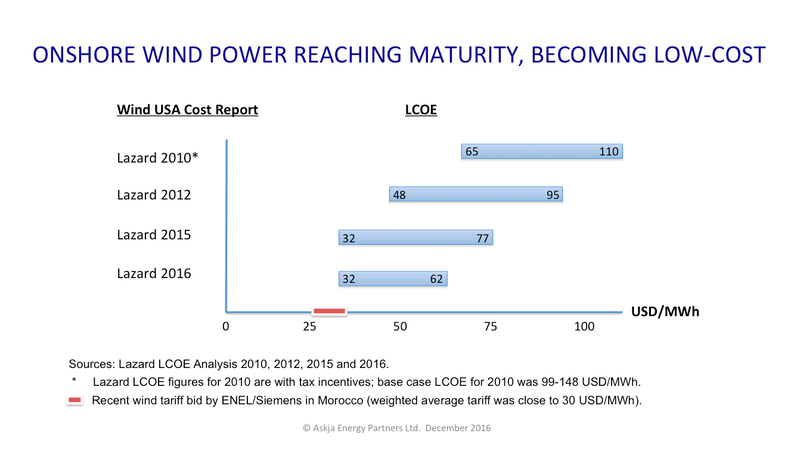 It should be noted that many of the power projects, described in the utilization category of the said Master Plan, have an expected LCOE between 40 and 50 USD/MWh (this especially applies to the geothermal projects). Having those cost figures in mind, it is interesting that high capacity wind locations outside Iceland offer as low LCOE as 32 USD/MWh (as explained by Lazard) and in rare cases even lower. When also having regard to other recent wind projects in high capacity areas, it seems clear that such projects offer LCOE that is lower than the expected cost of some of the planned geothermal projects in Iceland. We could refer to several other recent wind power cost-analysis for the same outcome. As an example, Goldman Sachs expects onshore wind costs to fall into the range of 30-35 USD/MWh due to technology advancements. With this all is mind, it would have been both interesting and important if Kvika/Pöyry would have made further effort to analyze the potentials and cost of possible upcoming wind power projects in Iceland. Of course it is also important to remember that extensive wind capacity may call for an increase in backup power. The extra cost due to such capacity additions may indeed make wind power more costly than explained by simple LCOE-analysis. However, the general assumption by Kvika/Pöyry, declaring Icelandic wind power in most cases more expensive than geothermal power in Iceland, seems somewhat hasty. The result may be an under-estimation of the potential of Icelandic wind power. And due to sensitivity of geothermal resources to over-exploitation, it is even possible that the expected fast-capacity growth of geothermal power in Iceland may in fact be an over-estimation. The report by Kvika/Pöyry is officially only available in Icelandic. To give our readers a clear idea about how the report explains and analyses wind energy, we hereby publish an English translation of the part of the report that focuses on wind power (chapter 15.3.3). Note that the somewhat long sentences and un-precise references simply reflect how the Icelandic text is put forward in the report. And we express that all the following text is a translation of chapter 15.3.3 in the report, so the text does not reflect opinions of the Icelandic Energy Portal. Wind is a well-known energy source. In recent years, technological development has made wind turbines more efficient and more stable. Also, the cost of constructing and operating onshore wind farms have decreased significantly in a short time, as seen on figure 106. Thus, wind power is closer to becoming competitive with other new energy projects in Iceland. Wind energy is increasingly harnessed worldwide. It is estimated that by 2020, the installed capacity of wind power in the world will be 1,000 GW, or as much as the hydropower in the world today. [Fig. 106 – Cost of onshore turbines (2014 USD/kW). Sources: Berkeley lab and US Energy Ministry; US Energy Ministry Wind Technology Market Report 2014. Link to source.]. Given the limited environmental impact of wind power compared to prolonged or permanent impact of hydropower, wind power should be considered as an important option for renewable energy production, especially in a country like Iceland, which has great wind power potential and is sparsely populated. [Ref. 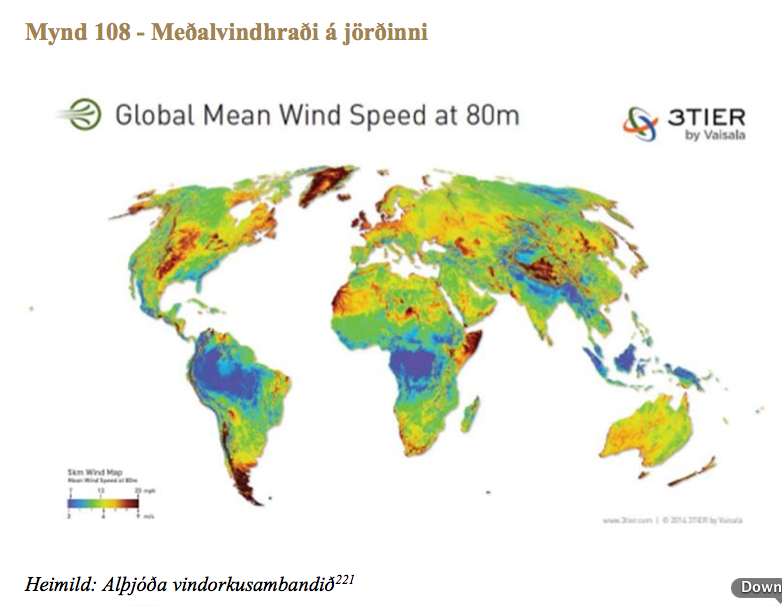 215: Icelandic Meteorological Office, Wind energy potentials in Iceland 2013]. Windmills need to be connected to the grid, which preferably should be close to the location of the windmill. It also makes sense to take population density and tourism into account when deciding where to locate windmills, as many feel they spoil the beauty of the landscape in which they stand. All in all, numerous factors need to be taken into account when deciding where to locate windmills. [Ref 216: Wind energy as option in Iceland 2012, Environmental considerations, James Dannyell Maddisson and Rannvá Danielsen]. In 2014, Europe had 12,820 MW of installed wind power capacity. [Ref 217: Wind energy in Energy statistics 2014 and wind energy scenarios for the year 2030, European Wind Energy Association 2015]. Table no. 30 shows the installed wind power in selected European countries by end of 2014 and forecast for 2030. [Table 30 – Installed wind energy capacity in some European countries and forecast for 2030. Source: European Wind Energy Association]. 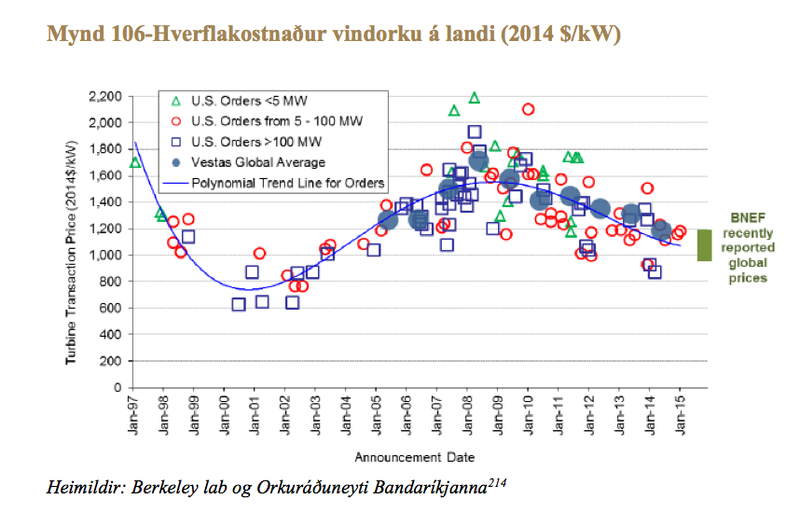 By end of 2014, installed onshore wind power capacity in Iceland was only 3 MW. Landsvirkjun [the national power company] has presented plans for two onshore wind farms to be evaluated in the third phase of the Master Plan [Icelandic Master Plan for Nature Protection and Energy Utilization]; one wind farm with an installed capacity of 200 MW delivering up to 705 GWh/year and the other 100 MW delivering up to 350 GWh/year, a total of 300 MW and more than 1 TWh/year. Private parties, both domestic and foreign, have also been exploring the possibility of building and operating onshore wind farms in Iceland. By end of 2014, Norway had constructed wind parks with an installed capacity of 856 MW, delivering an average of 2.2 TWh of electricity annually, with 31% capacity factor [ref 218: Governing department of water resources and energy matters in Norway, NVE], which constitutes to 1.2% of the country’s electricity generation. See Figure 107 – Installed capacity of wind power in Norway. [Fig. 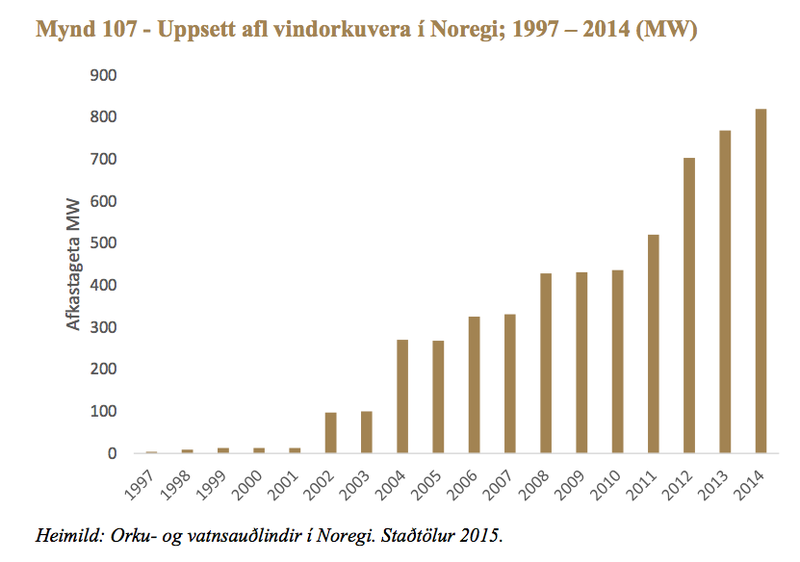 107 – Installed capacity of wind power stations in Norway; 1997-2014 (MW)]. The development of wind power in Norway has so far not been economical without subsidies and the wind farms that have been constructed have been subject to subsidies. Yet, Norway has in general good wind resources, compared to other countries. By the start of 2014, new wind power projects with a generation of about 9.1 TWh/year had been authorized in the country. However, it is unclear whether all this power will be developed. The possibility, however, exists if market conditions supports the investment, all the necessary planning has been completed, and permits have been given. [Ref 219: Figures from 2015, Energy- and water resources in Norway, Norwegian Oil and Energy Ministry]. Iceland is very well suited for electricity generation by onshore wind, as shown in Figure 108, which shows the average wind speed at 80 m height . [Fig. 108 – Average wind speed on Earth. Source: World Wind Energy Association. Global evaluation on wind resources. December 2014. Link to source]. Wind measurements give very good results and a limiting factor for the development of wind energy in Iceland will not be lack of wind, but political and environmental concern, proximity to other industries and services, power transmission and wholesale prices of electricity. In our simulation, the cost of onshore wind power is set higher than most other options and thus large-scale wind power development is not expected unless domestic demand will grow much or a subsea cable will be laid. This may change if the cost of new onshore wind power plants continues to decline. Thus, onshore wind energy could become a more economical option than geothermal power plants in the near future. 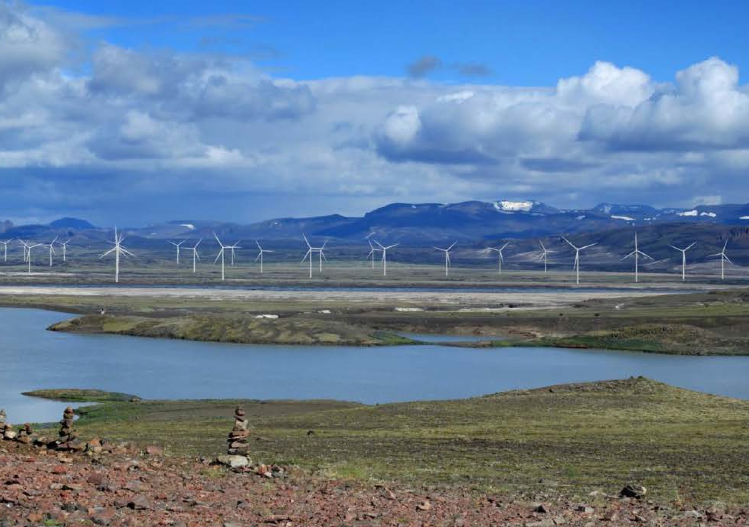 How fast will wind energy develop in Iceland? So far only four large wind turbines have been constructed in Iceland, all of them in the southern part of the country. The first were two 900 kW turbines from Enercon, which started operating in early 2013. The second two were 600 kW used Vestas turbines, set up in Iceland in 2014. The project owners are the national power company Landsvirkjun and private firm Biokraft. The nature of these first wind energy projects in Iceland is to obtain operational experience with onshore wind turbines in the Icelandic climate. The turbines are connected to the grid and both projects have been quite successful, offering more than 40% capacity factor. Having regard to the low- and central scenarios, according to the report by Kvika/Pöyry, absolutely no wind power is expected to be developed in Iceland in the next two decades unless the IceLink (or other subsea HVDC cable to Europe) will become reality. On the other hand, Kvika/Pöyry expect quite high investment in Icelandic wind power if IceLink will be developed. According to the high scenario, 1,600 MW of new wind power capacity may be developed in Iceland if the subsea electricity interconnector will be constructed. This is explained on the graph at left; the wind power is expressed by the green part of the columns. The graph is from a recent presentation by Pöyry. 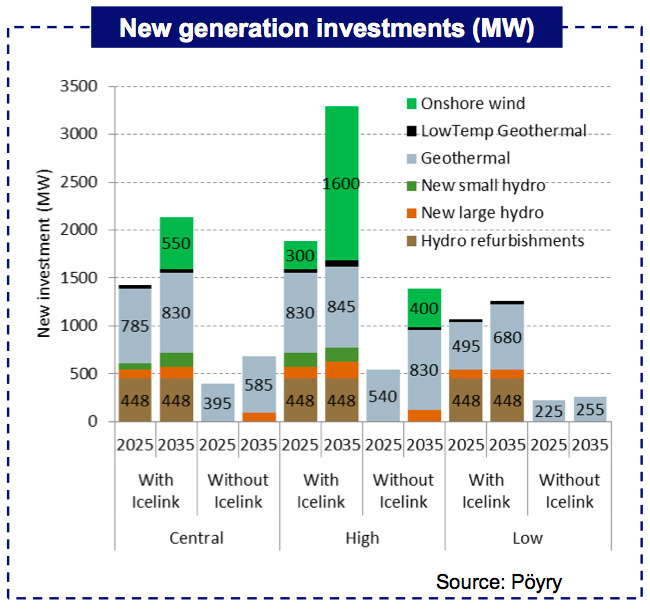 What is somewhat surprising about these assumptions by Kvika and Pöyry is the extremely low wind power investment expected in Iceland if an interconnector will not be developed. The fact is that Iceland has already harnessed the most economical options in geothermal power (and also in hydropower). The expected new geothermal projects will be quite costly. According to a recent report published by Samorka (the Federation of the Icelandic electricity industry, district heating, waterworks and sewage utilities in Iceland), the levelized cost (LCOE) of many of the new geothermal projects expected until 2035 is believed to be close to 35-45 USD/MWh. In addition, Kvika/Pöyry seem to have over-estimated how fast new geothermal power in Iceland can be developed. In fact Iceland does not have a very long history of extensive geothermal harnessing for electricity generation. The experience so far tells us that the geothermal areas are quite sensitive to over-exploitation. Thus, it seems possible if not very likely, that the true LCOE for new geothermal projects in Iceland may in fact normally be more expensive than Samorka claims. At least it is quite possible that to avoid over-exploitation, geothermal power development in Iceland may have to become substantially slower than expected by Kvika/Pöyry. Which would make more space for wind power development. Iceland has very good wind conditions in numerous locations close to the grid; locations which offer wind capacity between 40-50%. This has been confirmed by the two positive research projects in Southern Iceland, developed by Landsvirkjun and Biokraft, as mentioned above. The project by Landsvirkjun consists of two 0.9 MW Enercon turbines, while Biokraft has relied on two somewhat smaller and older (used) Vestas turbines. As the cost of wind power technology has been coming down, and is expected to become even lower in the coming years and decades, it seems likely that wind power will be developed in Iceland even without IceLink. 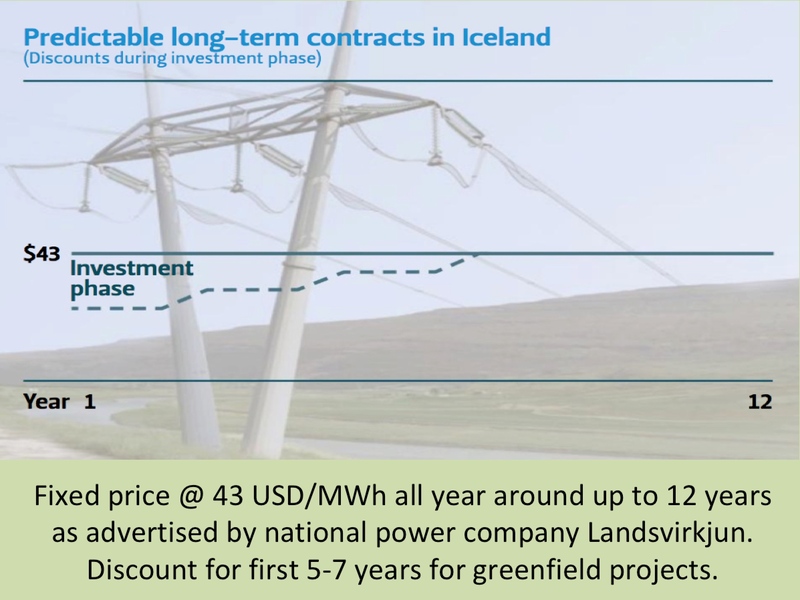 One should also have in mind that Icelandic power companies are already buying generation from the first wind turbines in Iceland at a price equivalent to roughly 40-45 USD/MWh. Due to the positive outcome of the two ongoing experimental wind projects, both Landsvirkjun and Biokraft are now planning the construction of first wind farms in Iceland. The combined capacity is expected to be close to 350 MW. In addition, a company called Arctic Hydro has introduced plans for a wind park of 20-30 MW. We, at the Icelandic Energy Portal, will be informing our readers more on these projects as they develop (two of the projects are currently in the phase of EIA). At this stage we will leave you with the claim that wind farms located in high-capacity locations in Iceland are likely to offer as low cost as new geothermal plants and even lower. This means a LCOE between 35-40 USD/MWh. Also, keep in mind that according to most recent report from Lazard, wind farms in Midwest USA offer as low LCOE as 32 USD/MWh. Having regard to Icelandic wind conditions, we should not be surprised if wind farms in Iceland may offer similar cost. And if so, wind power in Iceland is likely to develop a lot faster than predicted by Kvika/Pöyry.